TLDR: A first contact story with beings that seem like overlords at first, but are revealed to be something else. This 3 out of 5 story is elevated to 4 stars for succeeding in capturing the infinite wonder of the universe in ways I didn't expect. Aliens appear in the skies over earth - aliens with powers well beyond what the human race can match. They lay down the law and become known as beneficent overlords. Wars end, and humanity enters a new golden age - but who are these overlords? Only one man in the first generation has a hint at the truth, but he doesn't reveal what it is. Fifty years later, the overlords finally reveal themselves - and we discover we've known them all along, but not quite in the way we imagined. Psychic powers are revealed in the human population. Yet more years later, in the final part of the novel, many things are revealed about the Overlords, the nature of God, and the fate of Humanity. This summary is intentionally vague, but the novel covers a lot of conceptual ground and I'm trying to keep it spoiler-free. I've commented before on the rather wooden characters in AC Clarke novels. In this novel we first meet Strormgren, a Scandinavian Director General of the UN who has a special relationship with the Overlord known as Karellen, and for the first time I thought - at last, here's a genuine Arthur C. Clarke character. 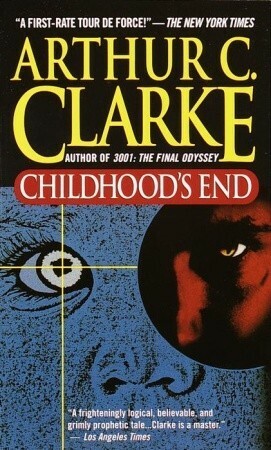 Sadly, Stromgren only appears in the first part of the book (of three), and then we're back to A.C. Clarke as usual. This novel has a few twists in it. One appears at the beginning of Part 2 where we finally get to see what the Overlords are. Stormgren caught a glimpse of the much earlier, in part one, but managed to hold onto his secret. I won't reveal the overlord's secret here, but suffice to say it was similar to what I was thinking, but not quite. Did you see Babylon 5? Remember when ambassador Kosh shed his armour to rescue John Sheridan from a fall from the monorail? That's what I was expecting in part 2 of this book. It's not quite what I got, but not too far off. But even though we know what the Overlords LOOK like, we still don't know their purpose or end game. The rest of part 2 reveals new mysteries that tell us us there's more going on behind the scenes, and the overlords continue to play their cards close to their chests. In part 3, all is eventually revealed, and we're taken on a brief but mind-bending romp across the universe as good, if not better, than anything I've read. Here at last we explore the nature of humanity, evolution, and god. Had I been alive in 1953 when the was published, my mind would have been blown! Reading this 55 years later, I'm a little jaded by having read the works of the giants that stood on A.C. Clarke's shoulders, but this book still has impact. Some consider it better than 2001 - I'm not so sure. 2001 is equally mind-bending, and perhaps a little less fanciful. I still think of that as his masterpiece. But this is close. There has been nothing like it for years; partly for the actual invention, but partly because here we meet a modern author who understand that there may be things that have a higher claim on humanity than it's own 'survival'." Definitely recommended - 4 out of 5 for me. It was nominated for a retroactive hugo for the year 1954 (in which no Hugo was awarded) in 2004. But it lost out to Ray Bradbury's Fahrenheit 451. Also nominated for that year were Hal Clement's Misson of Gravity (our March 2019 pick), Isaac Asimov's Caves of Steel, and Theodore Sturgeon's More Than Human (both now SF Masterworks selections). Clarke always disappoints character-wise, but never concept-wise. At some point in most Clarke books I have read, my jaw drops and I think "Oh my f*cking GOD that is AWESOME!!!" Well, that describes my experience with this one. I read this a couple of years ago. As you say, short on characters but long, very long, on the big ideas. Well worth the read.